As a 911 dispatcher for the Carter County Sheriff’s Department, Linda Shepard is used to helping others in distress. On Feb. 11, Southern Baptists in the Enon Association did their best to return the favor. Shepard and her husband, Phil, who is a detective with the Lone Grove Police Department, were at their son’s home in the northwest part of the city, helping him install a new water heater, when an EF-4 tornado hit the city around 7:30 p.m., Feb. 10. The Shepards live in the southeast area of town, west across Evergreen St. from the Bar-K Mobile Home Park, which was virtually destroyed by the twister. 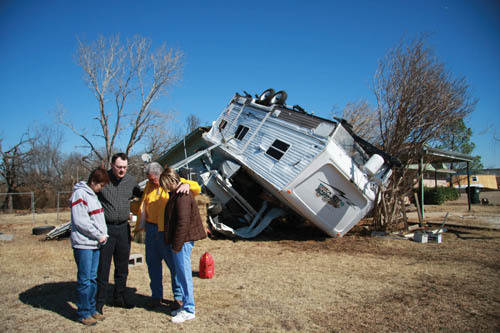 Their home’s roof and west side was damaged, primarily as a result the fierce winds lifting their pontoon boat and Winnebago onto that side of the structure. Shepard and her daughter, Cathy, a member of Elmore City, First, sat on the porch and watched emergency vehicles drive up and down Evergreen St. the next morning as recovery workers entered the trailer park looking for survivors. But, a visit by Sam Porter, Disaster Relief director for the Baptist General Convention of Oklahoma, this reporter and Brad Taylor, pastor of Ardmore, Southwest, turned their quiet morning of reflection into a beehive of activity. After praying with the two ladies, Porter called for the Enon Association chain saw team to come and begin removing debris from the Shepards’ yard. Less than 30 minutes later, the work began. Meanwhile, across the street, three dogs were working with two handlers each to search for victims of the storm, which had taken nine lives as of Feb. 12. The large trailer park looked as if someone had just scalped everything in it off with a huge lawn mower. The area resembled a landfill, with bits of insulation and fabric dotting the landscape and hanging from what twisted and snagged tree limbs remained. Overturned and smashed vehicles were everywhere. The scene was eerily quiet as the dogs and their handlers walked through the scattered debris. Relief efforts in this small town of about 5,000 people just west of Ardmore on Highway 70 were centered at Lone Grove, First. The church is located just west of the town’s Fire Department, which was serving as the emergency operations center. Dewayne Davis, the church’s music and youth minister, was directing the congregation’s response. Ironically, Davis was to be voted on in view of a call as the church’s pastor Feb. 15. The church had almost 75 people gather in its hallway, a designated city storm shelter, when the tornado swept through town Feb. 10. Oklahoma Baptists set up their No. 1 feeding unit at the church Feb. 11, and served their first meals at noon on Thursday, Feb. 12. The church also was serving food in its Fellowship Hall, which was set up as a repository for donations for victims. Donations included blankets, clothing, toys, diapers, meals ready to eat, bottled water and soft drinks. Several Disaster Relief chaplains also were on the ground in the area, ministering to those who had suffered loss from the twister, which was one of three that hit the state Feb. 10. Areas of Oklahoma City and Edmond suffered damage as well, although there were no reported fatalities. A Southern Baptist chain saw crew also was ministering in Edmond. Tornadoes are rare in Oklahoma in February; in fact it had been nine years since the state had been hit by a twister in February, according to National Weather Service officials.